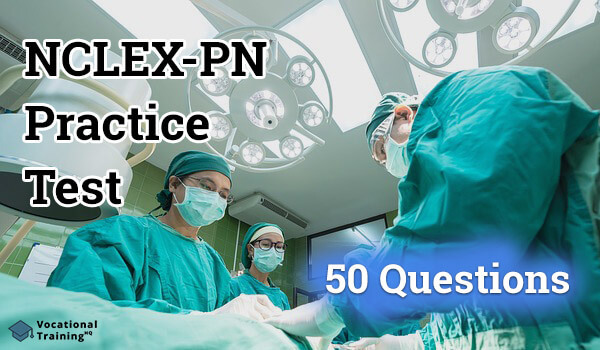 The NCLEX-PN Practice Exam is an entry-level nursing examination and it ought to be passed before the beginning of the candidate’s practice as a vocational/practical nurse. This is a National Council Licensing Examination for Practical Nurses administered by the National Council of State Boards of Nursing (NCSBN). It covers a number of topics in the realm of Medical-Surgical Nursing. The NCLEX-PN Practice Test confirms that the entry-level practical nurses are competent to provide functional and safe nursing practice. What kind of intended effect should a Stadol (butorphanol) cause to a postoperative patient? The patient reports feeling less nausea. The patient requires extra meals. The patient falls asleep half an hour after the medication has been dispensed. The patient has increased output of urine. This medication is a pain reliever which provides quality rest to post-operative patients. Children with cystic fibrosis often suffer from chronic sinusitis and nasal polyps. Which of the following medications is contraindicated to a patient with hepatitis A? Lipitor is an agent that lowers lipids and is contraindicated to a patient with this disease. Pancakes, ham, coffee, tomato juice. Oatmeal, apple juice, dry toast, coffee. Cornflakes, whole milk, banana, coffee. Bacon, scrambled eggs, toast, coffee. The diet for patients with hypertension must be focused on decreasing sodium and increasing fiber. The oatmeal is low in sodium while containing lots of fiber. The child will have to follow a special diet. The child should avoid straddling toys and rough play. The child shouldn't be diapered for 1-2 weeks. The pain of the child will decrease if warm compresses are regularly applied. The child mustn't get involved in rough play nor swim or play with toys such as rocking horse until the surgeon allows that. The patient should skip breakfast but eat more at lunch or supper. The patient should drink a glass of orange juice with several teaspoons of sugar. The patient should drink a glass of milk before bedtime. The patient should keep crackers on their bedside table and eat them before they arise. Crackers are a rich source of carbohydrates that reduce symptoms of morning sickness. Cleaning the stethoscope with water, drying it and returning it to the nurse's station. Leaving the stethoscope in the patient's room for further use. Using the stethoscope for assessment of blood pressure of other patients. Cleaning the stethoscope with alcohol and returning it to the exam room. The stethoscope should be left in the patient's room for further use. Which of the following should be a nurse's instruction to parents with an infant with congenital hypothyroidism? "The medication should be given once a day, every other day". "The medication schedule can be settled to obtain medication vacation". "The medication has to be given during the entire lifetime of the child". "The medication will need to be taken only during periods of rapid growth". An infant patient with congenital hypothyroidism has to take the medication during its entire lifetime. Glucotrol XL needs to be taken daily with breakfast. Which of the following indicates the condition of myasthenia gravis? Cogwheel rigidity and declined coordination. Progression of weakness that worsens at the end of the day. Ascending paralysis and loss of motor function. The most frequent symptom of a patient with this condition is weakness that progresses and becomes worse during the day. "Only the bones are affected by this disease". "The baby will need to take calcium supplements every day". "Remember to lift the baby by buttocks when diapering". "This condition is only temporary". The baby in this condition should be lifted by the buttocks during diapering in order to avoid any fractures. Patients with acute pancreatitis are ordered with NG tube to low intermittent suction and a strict NPO. What would these interventions do? Eliminate the need for analgesics. Prevent secretion of gastric acid. Decline the secretion of pancreatic enzymes. Reduce the need for insulin. A patient on a strict NPO status results in anti-inflammatory condition due to the declined secretion of pancreatic enzymes. Pain in the left lower quadrant. A board-like abdomen indicates peritonitis which is a complication of diverticulitis. Pyridostigmine is the medication used for the treatment of myasthenia gravis. A high-calorie diet with carbohydrates and low on proteins. A high-calorie diet that is high on fats but low on carbohydrates. A high-calorie diet that is high on both proteins and fats. A high-calorie diet that is high on proteins but low on fats. A high-calorie diet that is high on proteins but low on fats due to the AIDS patients declined tolerance to fat. Which of the following interventions would prepare a child with cerebral palsy for rehabilitation? Patching one eye to strengthen the muscles. Providing auditory training through music. Providing suckers and pinwheel to improve tongue movement. Improving muscle coordination by playing a video game. A child with cerebral palsy ough to be prepared for rehabilitation by developing tongue control that would contribute to the speech therapy. When do infants begin sleeping during the entire night? When they are 3-4 months old. When they are 5-6 months old. When they are 1 month old. When they are 2 months old. Infants start practicing nocturnal sleep of 9 to 11 hours when they are at the age of 3-4 months. A patient with coxa plana. A patient with rheumatic fever. A child patient who is suffering od this disease can easily become prone to latex allergy because of the frequent exposure to latex surgical products and due to the usage of the urinary catheters. "Change the position of the child every 20 minutes". "During percussion, use the heel of your hand". "The percussion ought to be done after meal consuming or at bedtime". "During percussion, use cupped hands". During chest percussion, a parent or a nurse needs to perform with cupped hands. What should a nurse do if she needs to dispense an antibiotic of 1.25 ml to an infant? Divide the medication's quantity into two separate injections and administer in each Vastus Lateralis muscle. Administer the medication through a single injection in the Dorsogluteal muscle. Divide the medication's quantity into two separate injections and administer one of them in the Vastus Lateralis muscle and the other one in the Ventrogluteal muscle. Administer the medication through a single injection in the Ventrogluteal muscle. An infant mustn't receive more than 1mL in the Vastus Lateralis. When should a patient with schizophrenia receive the following depot injection of his therapy with Haldol Decanoate (haloperidol decanoate)? The depot injections of Haldol ought to be dispensed every 4 weeks. Please mark the adequate instruction that ought to be given to the parents of a discharged child patient who is immobilized in a hip spica cast? "Provide a flat bed and place a small pillow beneath the cast". "A coloring book and crayons are most suitable activities for play". "The child ought to follow a high-calorie diet". "Remember to put a disposable diaper beneath the cast at the perineal area". A disposable diaper at the perineal area would prevent soiling of the cast by any physical excrements". The patient has difficulty in moving the digits. The patient reports feeling pain. The patient manifests coolness and discoloration of the digits. The patient has a body temperature of 100°F. Coolness and discoloration of the digits signalize poor blood circulation. Cherry-red with late, clearer tones. Orange with particles of calculi. Dark red and cloudy in appearance. Dark, smoky and with specific gravity. The urine would have cherry red color due to the extracorporeal lithotripsy. Cognex may provoke drug-induced hepatitis that is manifested with jaundice. The change of the patient's breath's sounds. Suctioning is the best solution for a patient with blocked airways that cannot be cleared. Which is the most critical symptom that ought to be reported to the physician by a patient with tuberculosis who takes Myambutol (ethambutol HCl)? Red discoloration of bodily fluids. The changes in color vision may appear as side effects of Myambutol. Which of the following is the primary cause of anemia in a patient who suffers from chronic renal failure? Insufficient production of erythropoietin is the primary cause of anemia in a patient who suffers from this disease. Encourage the patient to increase his fluid intake before the test. Inform the patient about the procedure of the test. Ask the patient if they're allergic to shellfish. Provide the patient with their favorite meal for dinner. Shellfish may provoke anaphylactic reaction due to the iodine, during the test. What is the role of the aspirin as a medication for a patient with transient ischemic attacks? To keep platelets from clumping. Aspirin prevents the platelets to clump together in order to block any possible forming of clots. Taking the prescribed medication for the rest of the patient's life. Taking the prescribed medication only if needed after a re-evaluation of the patient. Taking the prescribed medication for 18-24 months. The patient may not need to take the prescribed medication after a period of 2 weeks. The common medical treatment for patients with tuberculosis lasts for 18 to 24 months. Switching objects from one hand to another. An infant at this age may face injuries due to rolling over from beds that are not protected with rails. Which of the following is the most adequate instruction for the Dilantin (phenytoin) therapy prescribed to a newly discharged patient with mal seizures? "Remember to minimize the carbohydrates in your diet". "The prescribed medication can cause dental staining". "You will need frequent CBSs". "The prescribed medication can cause fatigue". The patient will have to undergo regular CBSs due to the side-effects of the Dilantin, such as aplastic anemia and agranulocytosis. What should a nurse have in mind as an order regarding a newborn male patient with hypospadias? The child patient needs to be circumcised in order to obtain voiding. The child patient mustn't undergo surgery before turning 6. The child patient will undergo surgical correction by the time he is 6 months old. The child patient mustn't be circumcised. A child patient who suffers from hypospadias mustn't be circumcised due to its sensitive foreskin that is used in construction. The coconut oil contains a high percentage of saturated fat which is not appropriate for a patient with elevated cholesterol levels. Which of the following is a characteristic of a stage III Alzheimer's disease? The patient is unable to recognize familiar objects. In this stage of the Alzheimer's disease, the patient fails to recognize familiar objects. "Remember to take the medication half an hour before having a meal". "Report the doctor for any changes in appetite and weight". "Remember to put sunglasses prior to sun exposure in order to prevent cataracts". "Remember to schedule an influenza vaccine". The patient, whose therapy includes steroid medications, must take an influenza vaccine every year. What should a nurse do to prevent contractures of a patient with an above-the-knee amputation? Elevate the patient's leg on two pillows. Place the affected leg between two trochanter rolls. Use shock blocks to keep the foot of the bed elevated. Put the patient in a prone position two times a day for 15-30 minutes. A patient with an above-the-knee amputation would avoid contractures if placed in a prone position, twice a day for 1-30 minutes. When do most children get all of their primary teeth? By the age of 12 months. By the age of 18 months. By the age of 24 months. By the age......of 30 months. By the age of 30 months, the infants should get their primary teeth. What should a nurse do if they notice that a radioactive implant is lying in the bed of a patient who suffers from cervical cancer? The nurse should put the implant in a biohazard container and return it to the lab. The nurse should encourage the patient to reinsert the implant. The nurse should pick up the implant by using tongs and return it to a lead-lined container. The nurse should discard the implant. A radioactive implant ought to be picked up and returned to the container. What instruction should a nurse give to a newly discharged patient who has undergone laparoscopic cholecystectomy? "Avoid a tub bath for 48 hours". "You should expect clay-colored stools". "You may experience lower abdominal pain in the following week". "You are allowed to have your regular diet in the following 24 hours". The patient ought to avoid a tub bath in the following 48 hours after having a laparoscopic cholecystectomy. What should the school nurse have in mind when a high school student who has suffered mononucleosis returns to school? The nurse should advise the patient to continue his antibiotic therapy in the next 6 month. The nurse should advise the patient to have a snack twice a day in order to avoid hypoglycemia. The nurse should advise the patient to avoid contact sports activities for several months. The nurse should advise the patient to increase their daily fluid intake. A patient who has suffered mononucleosis should refrain from any contact sports activities in order to avoid any possible injuries of the spleen. The medication should be taken at bedtime. The medication should be taken twice a day. The medication should be taken with meals or snacks. The medication should be taken in the morning, every day. The Creon is a replacement for the pancreatic enzyme and should be given along with meals and snacks. A diet based on meat, eggs, dairy products is most rich in vitamin B12. 1 hour, twice a week. 1 hour, four times a week. 45 minutes, twice a week. 20-30 minutes, three times a week. The aerobic exercises for the patient should be practiced three times a week for 20-30 minutes. What action should a nurse take when caring for a patient who suffers from breast cancer and has undergone a right total mastectomy? The nurse should put the patient's right arm across her body. The nurse should keep the patient's right arm on the bed beside her. The nurse should put the right arm of the patient in a separate sling. The nurse should elevate the right arm of the patient on pillows. The patient who has undergone total mastectomy should have their arm elevated on pillows in order to ease the lymph drainage. Which of the following indications is most likely to occur to a child patient with petit mal seizures? Abrupt muscle contractions in short intervals. Abrupt decline of the muscle tone. A brief lapse in consciousness. Petit mal seizures are most often indicated by a brief lapse in consciousness. The side effects of the Zyprexa (olanzapine), which is an antipsychotic medication is the development of Parkinsonian symptoms. A child patient with rheumatoid arthritis should practice exercises with light, passive resistance such as swimming. What does 2.5% of glycosylated hemoglobin of an adult patient with diabetes mellitus show? The patient can proceed with a high-calorie diet. The patient keeps the diabetes under control. The patient's insulin dose needs to be adjusted. The patient has no diligent control over her health condition. This percentage of the glycosylated hemoglobin shows that the patient has control over their diabetes.